Safely store corrosives under a workbench or lab counter for quick and easy access. 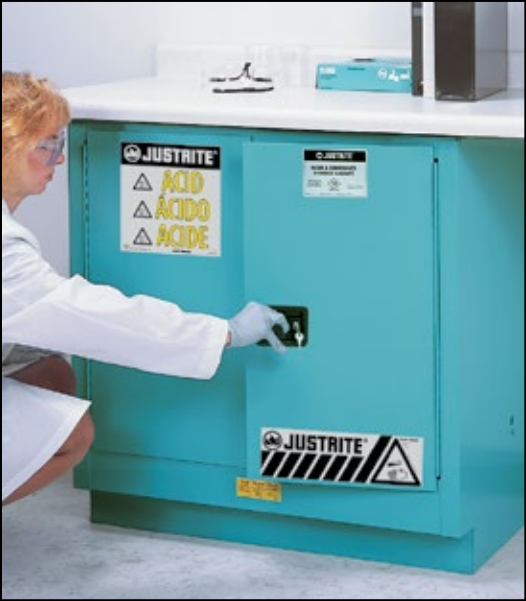 These safety cabinets incorporate the same quality features as Justrite flammable cabinets but also include galvanized steel shelves with attached polyethylene trays and a separate polyethylene bottom sump liner that can be easily removed for cleaning drips and leaks. Baked-on blue epoxy powder-coat finish—inside and out—resists acids, bases and solvents for added chemical resistance. FM approved.